Whether you are visiting Val d’Isere for the first time or you are a returning snowsports enthusiast, you will be seeking those runs that make your heart sing. Just because you have the Val d’Isere piste map doesn’t guarantee that you understand which slopes suit your abilities or the ski experience you came for. Combining experienced insider knowledge about the mountain with a clear understanding of the Val d’Isere piste map will ensure that every day of your ski holiday leaves you with a big grin on your face and never wanting to leave. Printed Val d’Isere piste map from the resort ski pass office. This paper piste map is handy to keep with you, but usually ends up like a ball of papier mache in your pocket. Official Live piste map from Val d’Isere tourist board with piste and lift status and weather. Val d’Isere piste map pdf to print or keep on your mobile phone or tablet. The Fatmap App 3D terrain Val d’Isere piste map for IOS, Android and web browsers. Get location based hi-res terrain models with all of the runs and ski lifts shown, along with your GPS location. You can stream route advice crafted by ski experts for free, or download your piste maps and go offline for under £10 per month. See the Val d’Isere piste map in colour coded 3D showing avalanche zones, gradient, altitude and live status of the runs and lifts. Wipeout microfiber lens cloth Val d’Isere and Tignes Piste Map is a cloth you can use for cleaning your ski goggles. It has the Val d’Isere piste map printed on one side and the Tignes piste map on the other. It will survive getting wet and won’t get torn like a paper piste map. It makes a great gift. Equipped with the Val d’Isere piste map and recommendations from dedicated hosts at ski chalets like Le Chardon, you have a winning combination that will ensure that you know before you go. You’ll soon be getting off the gondola at the top of the mountain, smiling contentedly to yourself at the impressive view as you start your first informed descent, fully aware of where you are going and what to expect from the pistes at Val d’Isere. Val d’Isère is one half of what used to be known as the Espace Killy ski area. It is linked to the neighbouring ski resort of Tignes to form a ski area of 300km of pistes, 10,000 hectares of off-piste and 44km of cross country trails. Val d’Isere offers high quality, snow-sure slopes for everyone from complete beginners to adrenalin driven experts. With a ski area three times larger than Whistler, the biggest area in North America, its long season stretches from the end of November into the first week of May. When other resorts are knee deep in slush, Val d’Isere can still offer light, fluffy powder and fresh, crisp groomed runs. The village is at an altitude of 1,850m, with the top slopes at nearly 3400m beneath the summit of the Pointe du Montet. The top lift in Tignes is on the Grande Motte and reaches 3,456m. All of the different ski areas at Val d’Isere are extremely well linked. You can work your way through the system of 94 lifts from Le Fornet all the way across to the Tignes village of Les Brevieres, with proper pistes all the way. 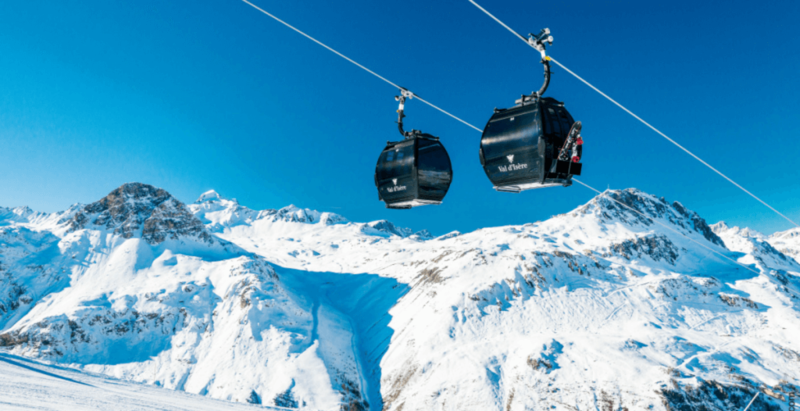 The recently added state of the art Solaise gondola has heated seats and wifi, and has increased capacity by 40 per cent, bringing an end to bottlenecks in high-season. At the top of the Solaise piste, a North American-style eatery and a free-to-use picnic area featuring microwaves and vending machines has also been added. Val d’Isere is a large and complicated ski area, but taking a little time to study the Val d’Isere piste map and getting advice from your chalet host will mean that you understand where the best runs are concentrated for your standard and how to use the lifts and pistes to work out your routes for the day. All of Val d’Isere’s ski areas have wide, cruising blue runs higher up and more challenging runs for strong skiers lower down. Beginners will find the best slow skiing zones and easy runs at the top of Bellevarde. From the centre of town, a couple of minutes’ walk takes you on to the Rond Point, a snow-covered open arena where the ski schools meet each morning and lifts rise up the mountains at either end. The Train Rouge is a reliable and free ski bus that loops around all of the ski lifts up from the valley, as well as Val d’Isere’s satellite villages every three minutes at peak times. During the day it is an integral part of the lift system. La Daille is a hamlet at the eastern end of the valley. You can reach it by the ski bus and then use the lifts and pistes to head towards Tignes. Ride the Funival underground funicular to the top of Bellevarde, which is a great ski area for families just starting out. This is also the starting point for the exhilarating OK men’s downhill course back down to La Daille. Bellevarde at 2827m, at the other hand of the Rond Point, is Val d’Isere’s piece de resistance. You can get there in a single trip using the huge Olympique gondola, the Funival from La Daille or two chair lifts. The big collection of green runs at the top is perfect for beginners and families. Beginners and intermediates should take the gondola back down the mountain to avoid the very steep and challenging runs down to the resort. La Face is a steep and extremely challenging black run back down, and was the venue for the men’s downhill at the 1992 Albertville Olympics and the 2009 World Championships. It is best skied early in the day before the snow softens and it gets chopped up. Sharp edges on your skis are essential. The back of Bellevarde is the starting point for a huge area of various pistes that head towards Tignes. Solaise is a network of intermediate runs of varying standard, including the Rhone-Alpes black, the FIS women’s downhill course built for the 2009 Winter Olympics. Anyone who is not a confident intermediate are best advised to return to the valley at the end of the day by either of the two lifts. Le Fornet is the bus stop after Le Laisinant. Taking the cable-car from here is the first step on the long journey by gondola and chair up to the Pissaillas Glacier and Val d’Isere’s highest lift beneath the Pointe du Montet. The glacier is open for skiing in June and July during the French summer holidays and winter continues here for 12 months of the year. When the resort is at its busiest, those familiar with Val d’Isere head here to catch the Laisinant Express chair. From the top you can connect to runs in the direction of Solaise or with Le Fornet. If you have the ready cash then Bonneval is a great trip from Le Fornet. You will need a guide, good weather and a helicopter to get back to avoid the three hour taxi ride. The seamlessly linked resort of Tignes also has a huge amount to offer. The off piste terrain is enormous and taking a guide is the only way to really do it justice. The view from the top of La Grande Motte in Tignes is breathtaking. Another great viewpoint is the top of the Grand Pre chairlift, from where you can enjoy spectacular views of the Vanoise National Park. You will often be able to watch parapenting and speed riders challenging themselves off-piste. Whether you have a family, group of friends or are skiing with business colleagues, understanding the Val d’Isere piste map will allow you to make the most of your time on the piste. With something for everyone, make the most of your ski chalet host and you will want to return again and again. Based in the Edinburgh head office, Lewis is the Sales and Marketing Manager for Le Chardon Mountain Lodges. Having spent time living and working in both Val d'Isere and Edinburgh this will be his 13th winter with Le Chardon. When is best time to go skiing?